Proven Shelf Stable: With variations of less than 5% over 2 years from date of manufacture when stored at 98°F / 37°C. This product is being reformulated. Most probiotic supplements are made from fragile, lactic-acid based organisms. Prescript-Assist is different. 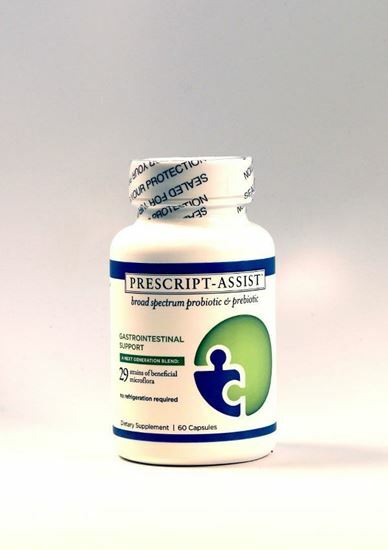 Available through healthcare practitioners, Prescript-Assist is a next-generation, clinically proven probiotic supplement that is unlike any other probiotic on the market — supported by peer-reviewed clinical studies, and inherently acid-resistant and shelf-stable without refrigeration. Be confident your probiotic supplement will deliver. Choose Prescript-Assist™. Why worry whether your probiotic contains adequate, living flora sufficient to improve your health? Unlike fragile probiotics that require refrigeration and novel, untested manufacturing techniques to be effective, Prescript-Assist™ is a proprietary formulation of 29 naturally resilient strains that support your body's natural intestinal balance. If you are pregnant or nursing, consult with a healthcare professional before use.